JT IRREGULARS: "The US's most secretive intelligence agency was embarrassingly robbed and mocked by anonymous hackers"
"The US's most secretive intelligence agency was embarrassingly robbed and mocked by anonymous hackers"
"The National Security Agency, the US's largest and most secretive intelligence agency, has been deeply infiltrated by anonymous hackers, as detailed in a New York Times exposé published Sunday. "The NSA, which compiles massive troves of data on US citizens and organizes cyberoffensives against the US's enemies, was deeply compromised by a group known as the Shadow Brokers, which has made headlines in the past year in connection to the breach. "The group now posts cryptic, mocking messages pointed toward the NSA as it sells the cyberweapons, created at huge cost to US taxpayers, to any and all buyers, including US adversaries like North Korea and Russia. "Furthermore, a wave of cybercrime has been linked to the release of the NSA's leaked cyberweapons. "Another NSA source who spoke with The Times described the attack as being at least in part the NSA's fault. 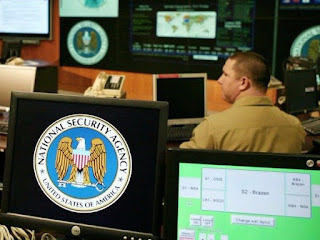 The NSA has long prioritized cyberoffense over securing its own systems, the source said. As a result the US now essentially has to start over on cyberinitiatives, Panetta said." I believe that these various groups and businesses are being "invaded" by hackers at the very highest levels. For the U.S., it's a giant security breach. For many of the hackers, it's a lark. So, cyber security more or less doesn't exist with our government. What a mess. Hire the hackers.